George Soros, born as Schwartz György is a Hungarian-American financier, businessman and notable philanthropist focused on supporting liberal ideals and causes. His ethnically Jewish parents changed their family's name from Schwartz to Soros as one of their assimilation strategies to avoid persecution by the forces of Adolf Hitler in Hungary. He says his lifelong attraction to civil freedoms is due in part to his first-hand view of Nazi, and, later, Communist oppression there... Soros has been married and divorced twice: to Annaliese Witchak (1959-1978) and to Susan Weber (1983-2004). His five children are Robert (born 1963), Andrea (1965), Jonathan (1970), Alexander (1985) and Gregory (1989). 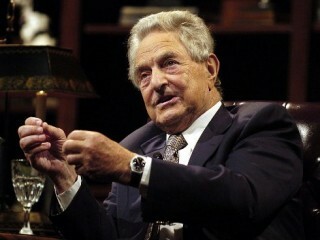 View the full website biography of George Soros.